Germany: Choreo for the Stendal riots in 2006. Back in 5th of February 2006 Hansa Rostock fans were on their way to Eintracht Braunschweig, but due to bad weather the game were cancelled. 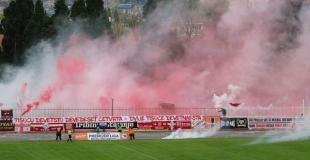 A lot of frustration among the traveling fans who ended up in Stendal after the cancellation of the game. At this station the fans were met by hundreds of police officers. 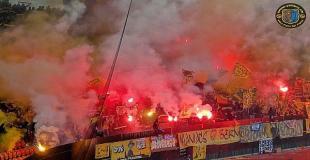 The situation quickly escalated and several newspapers spoke of one of the worst hooligan incidents even seen in Germany. 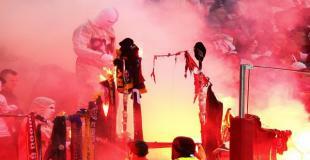 It was estimated 200 000 euros of property damage done by the Rostock fans. Last weekend Suptras Rostock saw the opportunity to remember to the riot in Stendal 13 years ago (banner: "13 years of Stendal Randale").